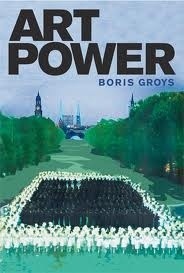 I’ve just completed a book by art theorist, writer, professor and expert in contemporary and Socialist art Boris Groys. Art Power is a collection of his essays that explores the balance of aesthetic and political power among artists, collectors, curators, and the audience. The book is a must read, though hard to plow through the last few essays on post-Communist art. Which he would likely say is because I am a student of Western art, where the issues of Communism were given my blind eye. I’ll agree (sort of, except I’ve studied plenty of Asian, Social Realist art, Diego Rivera, etc), and say they were still hard to get through. – He believes that images of war and terror are the new visual authority. – He argues that a museum can be a place where we are reminded of past egalitarian projects and not be led by the dictators of contemporary taste (radical). – basically that’s how they used to be where prevailing tastes of the 19th and 20 centuries were defined by museums. Versus now we are generating our taste through media. There are more equally radical views, but these resonated most with me. In its essence the book argues that the contemporary art market pays attention only to art production as commodity and not as political propaganda. Groys argues that there is art with political agenda, though the marketplace pays it no attention. Thus art and politics are connected in at least one fundamental respect: both are areas in which a struggle for recognition is being waged. He argues that culture producers – artists – are concerned nowadays with the gaze of the audience, where the object itself is not the end result but the space where it is exhibited becomes the major object of perception, or the “true artwork”. This would easily be illustrated by the trend in experimental curating, or artists as curators and vice versa. A prime example would be the popularity of artist Olafur Eliasson – where the experience in the space and that only becomes the art. Or the varied projects of curator Hans Ulrich Obrist whose strengths are his empathy for artists and a serious curiosity for their art practices. In keeping with Groys’ radical thinking, I’m going to make a prediction – that the pendulum is swinging back further than we realize – to a place where authorship and authority will return. Where mediums that require presence and a slow down in tempo are required. Yes painting fits squarely, or rectangularly, in this thought.